Haitian-American Chanel Thervil and Dominican-American Iris Lapaix have a strong friendship, despite the long history of cultural tension between Haiti and the Dominican Republic. They created Mariposas & Mangos to highlight the uniqueness of of each country while unifying them in support of positive cultural exchanges. The yellow Haitian mangos depicted reflect the sweetness of Haitian people and their hope for a positive and fruitful future fueled by their resilience. The Mariposas (Butterflies) reflect the transformative change activated by The Mirabal Sisters, a trio of Dominican women who became martyrs after protesting the mass killing of Haitian people ordered by dictator Rafael Trujillo during a religious retreat. The red and blue abstract pieces reference the colors shared by the Haitian and Dominican flags. The collage featured on the surface of the work was created by community members who responded prompts about their own cultural staples, hopes, and reflections about what’s needed to create transformative change in their own lives. Together all of these elements are an example of the beautiful things that can be created when people are unified by their differences rather than divided. 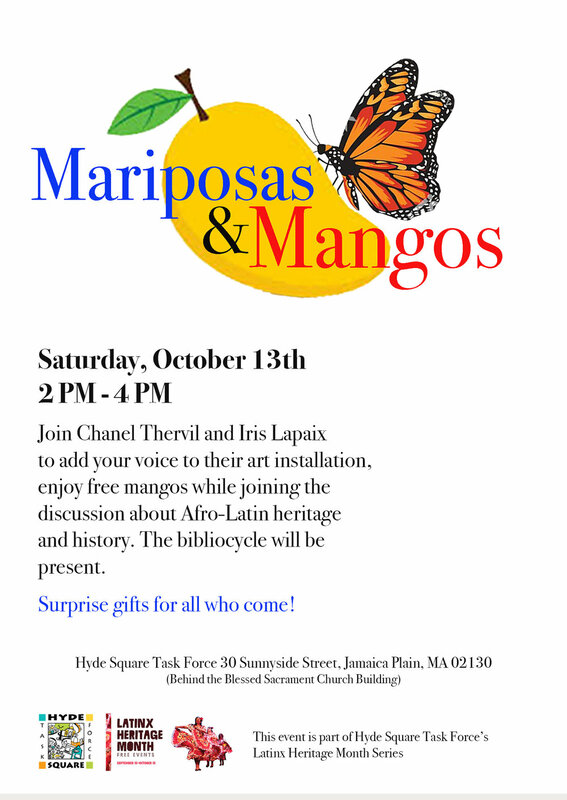 During the communal unveiling of the work the Boston Public Library’s Bibilocycle was present with books about Haitian, Dominican and other Afro Latinx/Latin cultures to encouage cultural exchange. All attendees were gifted with mangos and enamel pins featuring the Mariposas & Mangos logo as a thank you.